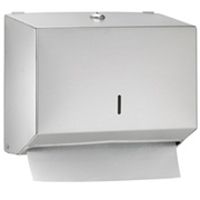 [XPB-252] Surface mounted Paper Towel Dispenser is fabricated in 22 gauge stainless steel with exposed surfaces in an architectural satin finish. Towel Dispenser holds 200 multi-fold or 100 C fold paper towels and constructed with a tumbler lock. The overall dimensions are 11"W x 8"H x 4"D, and is ADA compliant. For shipping quotes, orders or questions please call our Customer Service Center at 1-877-483-9270.